This June, the strangest super-team of them all emerges from the depths of Monster Metropolis to take Battleworld by storm in MRS. DEADPOOL AND THE HOWLING COMMANDOS #1 – a new Secret Wars series! Blockbuster Deadpool scribe Gerry Duggan and artist Salvador Espin bring you an explosive new adventure as Deadpool’s betrothed and a monstrous legion venture across Battleworld and beyond! Monster Metropolis – an underground city buried deep below Manhattan. Brimming with monsters, creeps and spooks – Monster Metropolis is home to any and all things that go bump in the night. And it’s undisputed ruler is SHIKLAH, Queen of all monsters! In her world, she ruled over Monster Metropolis and was married to Deadpool, the Merc With a Mouth. But on Battleworld, nothing is what it once was. With her husband deceased and her city now residing beneath an entirely new planet, Shiklah now leads a super team unlike any you’ve seen before! Enter the Howling Commandos – the most monstrous team of them all! Werewolf-by-Night! Frankenstein’s Monster! The Living Mummy! Man-Thing! And Marcus the Centaur! Set loose on this new planet, these five creatures of the night and their fearless leader are ready to enter the Secret Wars fray. What will happen? No one knows. 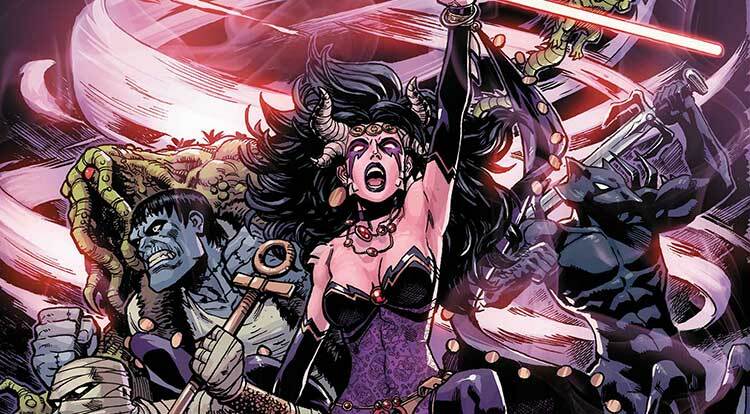 But one thing is for certain – Battleworld won’t know what hit it! Sharpen those fangs and claws, because a deadly new super team is set to take Battleworld by storm this June. 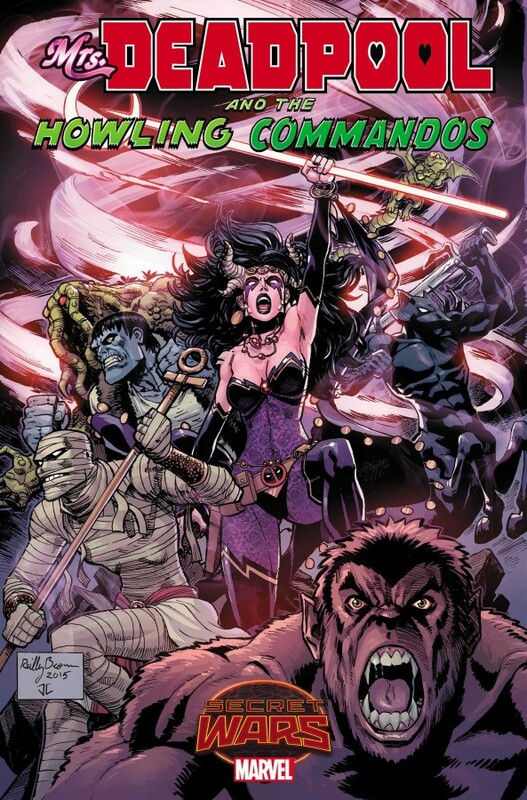 Be there when they’re let off the leash in MRS. DEADPOOL AND THE HOWLING COMMANDOS #1!